There’s no doubt about it the furniture will make or break a commercial space. It governs the look and feel you portray to your customers whether it’s sleek and contemporary, rustic abundance or even the eco-friendly wow factor you need to get it right, first time. To name but a few of the more notable ones. We pride ourselves on offering the highest quality furniture, that is long lasting at a very affordable price. If you’re looking to buy in bulk and do not see a bulk purchase option in our catalogue, then please do call our friendly Sales Team to get further advice on the options available to you. From Outdoor Sofa Sets, to Corner Units to Dining and Picnic Sets the choice is endless. Classic A-Framed Designs - from the FSC Certified Sherwood Range to chunky reclaimed teak. Round Picnic Tables - from the gorgeous Orbit Range to the chunky and solid hand finished sets from Woodberry. Eco-Friendly Sets - recycled plastic in a range of finishes to Glass Reinforced Concrete, (GRC), all moulded to look exactly like wood. We find our Water Hyacinth Furniture is very popular with commercial buyers - probably because it offers something different and is highly contemporary. In terms of recommendations our Montana Sofa Sets are hugely popular and our Pacific Dining Sets offer a combination of hand woven all hyacinth sets or hyacinth chairs combined with stunning teak table - they all come in a variety of sizes to suit all needs. However, this is not to take away from the popularity of our stunning outdoor rattan dining and seating sets. Tightly hand woven from the highest quality synthetic fibres, many with purchase guarantees for up to five years we are positive you won’t be disappointed here. And rest assured all fibres are tested for suitability of use across a wide range of outdoor temperatures to guard against cracking or splitting and they are UV and colour stabilised as standard to stop colour fading with exposure to direct sunlight. They’re tolerant to all types of water as well - sea and chlorinated water included. Modular and Fixed Corner Units. Its dense, oily nature make teak quite simply the best possible timber for use outdoors without the need for external protection and with little likelihood of the timber cracking or splitting with exposure to the elements. We have a vast array of Teak Dining Sets in a variety of sizes from huge three metre dining sets to smaller four chair square table sets. 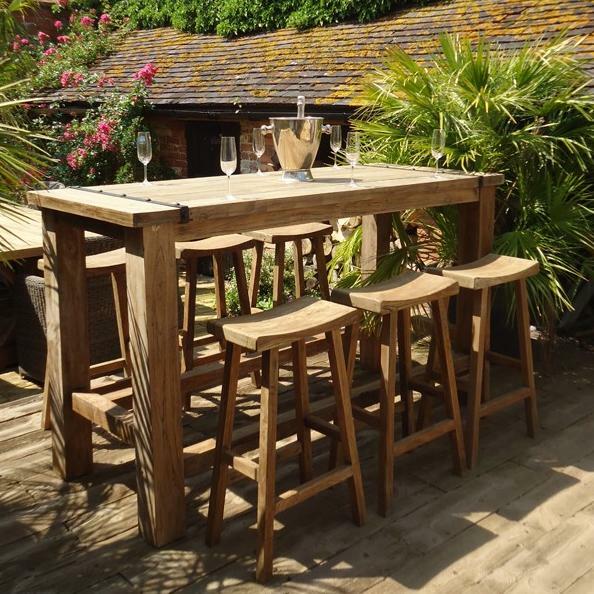 They are all hand finished using mortice and tenon joints reinforced with teak dowels for maximum strength with regular use and the majority come with an option to add parasols, seat cushions and the like. Again we like to offer as broad a range as possible with these. So, you will find rustic and very eye catching reclaimed teak sets with antique appeal at one end of the spectrum; the Meranti Bar Set for more middle of the road appeal and then the Luxor Bar Set which stands firmly at the contemporary end of our range. Attention to detail is a must and careful consideration is needed to get this right. Shelter is a necessary add on for commercial buyers in the UK climate and, again, we offer plenty of choice. Some highlights from our range of options? The Four Seasons Gazebo has to be one of our stand out ranges with loads of options from Screen Houses and regular Gazebos in a variety of sizes to Wall Sun Shelters and Combination Gazebos. Pop Up Gazebos offer flexibility when your outdoor space is used periodically for functions, weddings and the like or where a portable option to an off-site location is needed. Or, for more cosy and very stylish option you can take a look at the stunning Bamboo Gazebo that comes fully assembled and complete with furnishings. This on display in our Showroom and we strongly recommend you come and view it as it is a lifetime investment and won’t fail to impress close up. These come in a variety of shapes, sizes and styles and offer a huge variety in choice. 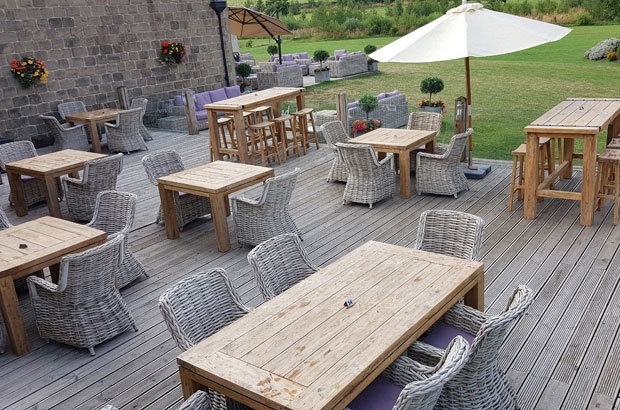 Classic Garden Parasols - usually bought in bulk by commercial buyers the classic design with straight pole topped by a canopy and usually slotted through the middle of an outdoor table. We have polished aluminium, laminate bamboo and fibreglass based models all with very robust proportions. Cantilever Parasols - made by Roma these are free-standing with cantilever and/or tilting mechanisms with the main frames rotating 360 degrees for maximum flexibility. Wall Mounted Parasols - made by Turino these are great for smaller spaces as they fit snugly back against the wall when not in use. Commercial Parasols - made by Milano these are absolute monsters and offer shade to a very wide area whilst having an easy to operate winding mechanism that takes the weight out of the lift. The Athena Plus Gas Patio Heater - with its impressive pyramid design and mesmerising gas flame this really does look the business and we have recently introduced a new model that has flashing LED panels with four settings and 12 colour options. Or, the stylish and more compact Santorini Patio Heater with a polished aluminium rounded body and, again, ignited with a gas flame. Both models comply fully with all safety specifications. The little extra’s can really make difference in any outdoor space and give it that extra little bit of clout. Maybe you hold regular BBQ’s and outdoor functions during the warmer months in which case you may want to add a little practical talking point with one of our Novelty Drinks Coolers. And obviously you can never have enough storage so one of our Outdoor Cushion Boxes will work a treat to sit in a corner and de-clutter or simply act as a place to keep things protected in the colder months. Or we have a huge collection of ornaments that are all handcrafted and bespoke with eye catching designs to give the place some added pazzazz. Whatever your needs be sure to contact our friendly Sales Team in the Midlands if you require further assistance.